Lauren is one of the craftiest people I know with a love for rainbow colors, glitter, and Christmas decorations. She even has her own craft room in her house nicknamed “the craft castle” that definitely lives up to it’s name (just check out her pictures on Instagram!). In the spring of 2014, she was looking for a way to make meaningful gifts within her budget for the ten weddings she and her husband were invited to that year. An idea was born in her craft castle to use string art to create name boards for each couple. Her beautifully intricate work has now expanded from name boards to custom boards with holiday phrases and inspirational messages. She can also create a string art board of virtually any object or creature imaginable, whether it’s a watermelon, owl, pumpkin, elephant, or snowman to name a few. Lauren’s dream was to make crafting her full time job, and her business has become such a success over the past year that she’s been able to make this dream come true! I’ve ordered several name boards from her myself for wedding gifts and she never disappoints with the beauty of her finished product. Check out her Etsy shop at and follow along on Instagram @thehonakerhome to see all of her fun creations, but be warned, you’ll want to own them all! Side note: Anchor Drop team member Courtney was gifted with one of Lauren’s amazing string art pieces for her wedding. Both she and her husband love it! When Molly and I met, she was in school working towards her degree in Elementary Education. So of course we instantly bonded over our love for kids and teaching. When Molly became a mom to her adorable little boy, Liam, she decided to take some time off from teaching and use her talent for sewing to create her own business making one of a kind clothing apparel for infants. She specializes in making the cutest leather mocs and comfy Henley Sweats. Her latest line of leggings made with the softest organic fabric came in such adorable prints that I wish she made them in my size! In the two years since Molly opened her Etsy shop, what started as a small side business has turned into a full time career that has allowed her to stay home with her family (which has also grown this year with the birth of her second son!). Check out her Instagram @madebymolly and you’ll often get to see her cute little guys modeling her newest creations! If you’re looking for something stylish and snuggly for the littlest ones in your life then head over to her Etsy shop now! You’ll be sure to find the highest quality of work and love put into each handmade item! My dear friend Krista and I share a mutual love for all things Africa. It is our passion and one of the bonds of our friendship. Last year, Krista made her second trip to Africa and traveled to Uganda with her church to serve alongside Compassion International. While she was there, she had the opportunity to meet Wasswa, the little boy she and her husband sponsor through Compassion. Upon returning to the States, she decided to use her talent of knitting to open her own Etsy shop and give back a portion of each purchase to help with the sponsorship costs for Wasswa. Krista uses quality, locally sourced yarn to create adorable booties and beanies for babies and stylish custom knit hats for adults. If you’re looking for something to keep you warm and stylish this winter or the perfect gift for a girlfriend, check out her Etsy shop at here and follow her on Instagram @wovenandthreaded. While you’re at it, check out her website www.wovenandthreaded.com to learn about her brand new consulting business. Krista is an amazing writer with a gift for sharing stories of how God is weaving a greater story through each person’s unique purpose. When I moved to Chicago, I was desperate to find an athletic/active community similar to the one I lived in Indianapolis. When my now husband (yay!) and I moved to Oak Park, IL, my first stop was the women’s athletic boutique I had been dying to visit since we decided to move – Lively. I was running the Chicago Marathon in just over a month and needed some gels, but when I walked in the door, I was blown away by not just the awesome selection of gear (not just gear, but amazing quality, cute gear), but by the incredibly supportive staff. I walked out of the store with way more than just my gels – I walked out with four hand-written note cards directing me to the nearest and safest trails, a schedule for the weekly group runs out of the store, and an invitation to join the Women’s Running Club Best Foot Forward. Lively is so much more than a store – it’s a community institution that helps women lead healthier, happier lives. Visit Lively on Facebook here. Ok, so Janelle and re:Find Joy aren’t necessarily a shop, but they are a small business that offers exceptional service. Janelle and I have been friends for almost eight years and she was the “lead designer” (re: lifesaver and master of everything) along with my mother-in-law (also master of everything) for my wedding this past October. From floral to signage, props to general design direction, she made everything come together perfectly – and that’s just for a wedding! As her real job, Janelle (who is re:Find Joy) is a brand and space stylist, as well as a graphic designer and prop rental studio in Portage Park, IL, but she does work all across the U.S. Find out more about her work on her website and be sure to follow her on Instagram and Pinterest! My sister began telling me about Fresco Spice Blends a little over a year ago. I admit I was cautious at first, but I was hooked as soon as I tried them. They are actually out of my hometown Fort Wayne, Indiana, which gives me hometown pride (and I know my dollars are going to a community of people I know and love). Whenever I use them to make something people are always asking me how I seasoned or flavored something. Sometimes, if I’m honest, I don’t want to give my delicious secret away, because it really has nothing to do with me! My top three favorites are Vanilla Apple Pie Spice for anything baked good, City Grille for burgers (oh my gosh I can’t even begin to tell you how good burgers taste with this), and Sweet Red Bell Pepper and Garlic is especially delicious on roasted vegetables. I also appreciate that they are very conscientious about the products they use. If you are looking for great gifts for the cook of your family, these come HIGHLY recommended! I found this little gem of a business last summer at the Arlington Heights farmers market and fell in love with their products. As someone who reacts negatively to many foods, I appreciate how careful and thoughtful they are with their ingredients. I also know they consult with a R.D. on what ingredients and changes they should be making. Not to mention their stuff is nothing short of delicious and amazing! I have incredibly talented friends, and Erin is one of the most talented people I have ever met. She isn’t just talented, but full of wisdom and vision. When she does something, it is with her whole heart and it is well researched. Recently she has started on a new adventure of making bags. I’ve seen these in person and they are absolutely adorable and of high quality. She recently spent time under a professional shoe maker learning techniques with leather and is using her skills on the handles for these bags. In case you have a thing for vintage clothing, she also finds vintage clothing, rehabs it, and sells it as well. Visit her Etsy store here. If you’re looking for adorable hats with a noteworthy cause, this is it! All the hats are made in America and the organization is run by a group of college students. But the coolest part is that their goal is to provide every child battling cancer with a hat! So not only do you get a super cute, super comfy and super unique hat, but a child in need gets one, too! I encourage you to the check them out and pick some up for your favorite people. As a stay at home I have many friends who run their own small businesses. One of my favorites is Sweetie Baby Boutique. Julie, the owner and fabulous friend, designs adorable and affordable headbands, clips, chunky necklaces and leg warmers. She started the business in June 2013 after some encouragement from her husband (who also inspired the name) and has used Etsy and Facebook to steadily grow. Julie is a Navy wife and mom of three beautiful girls who lives with her family in Poway, California. She stays busy with her girls and still manages to produce amazing products. Each item is handmade and done with impeccable quality. Julie is constantly sending out orders and strives to satisfy each customer, doing her best to always deliver on time if not early. She is frequently selling to bridal parties and families for photo shoots. Holidays provide a busy time for her as she has adorable seasonal headbands. To top this off, Julie is an all around fabulous person and I am blessed to call her a friend. Ambre Blends is a women owned and run business out of Indianapolis, Indiana. They have an online shop as well as several distributor locations. I like them because they are local, use pure ingredients and they work. Their products are unique and oh so wonderful. I personally am using their natural deodorant. I have put the natural deodorant to the test, too! I did some days of a 21 day challenge and didn’t stink or feel like I was lacking confidence. I would recommend finding a distributor and testing each kind of sent out as they will adjust to your natural chemistry and create your scent. Each will smell differently with your skin. I have received so many compliments. Live Crude was created by Master Esthetician Denise Cartwright who struggled with finding the right regimen to help her keep her skin normal and balanced. She developed this product based off the oil-cleansing method. To start, you might consider a Starter Kit. I also have personally used this product and can vouch for the results. It worked well in keeping my skin moisturized and soft. They have a lot of tutorials and how-to’s on their site. All ingredients are naturally derived and the French clay and green tea detox masks are wonderful. Upon using it, I don’t feel the need to wear make up daily anymore. I just have this natural glow now. Bite Beauty originated in 2009 out of Toronto Canada by founder Susanne Langmuir. Her guiding philosophy? “You eat what you put on your lips, so your lipstick should be good for you.” I love the fact that all of their make up is food grade ingredients and antioxidants. I originally was looking for a good lip exfoliate. I came across Bite’s Whipped Cherry Fruit Scrub. It smelled and tasted like candy. It worked extremely well on my chapped lips. It was better than anything else I have tried on the market. Their lipstick/gloss collections are brilliant and wonderful colors. Dr. Dan Viders, a Dermatologist in central Massachusetts, is the creator of an amazing lip balm which will help soothe and clear up any lip irritation. He has a very cool story actually. My cousin recommended me try this as her irritated lips were cleared up in 2 days. Perfect for the winter time. Dr. Dan is now working on formulating a chemical-free lip sunscreen which is pretty exciting! Pst: for more of my favorite make-up suggestions and more about Dr. Dan’s Lip Balm, check out this post. Chia Seeds – Pack full of nutrients such as fiber (yay for good digestion! ), protein, omega-3s (the good fat), calcium (you can get this from more than just dairy), manganese, magnesium, phosphorus, and more! These tiny little seeds expand in liquid and give you a texture I really enjoy (but this can be an acquired texture). Pumpkin – Pumpkin season is wrapping up, but that doesn’t mean we still can’t talk about it’s health benefits. Pumpkin is high in Vitamin A, which aids in helping your eyesight to stay in tip top shape. They also contain an impressive amount of Vitamin C, and it is no secret that Vitamin C helps the immune system. So in the last days of pumpkin season, eat it up with health in mind! Coconut / Coconut Milk – I love coconut. I mean, I REALLY love coconut! Coconut milk is my favorite cow’s milk substitute. Dr. Axe has a great article on benefits of coconut milk. I encourage you to read it, because even a summary of the health benefits of coconut milk would not do it justice. Maple Syrup – Pure Grade-B maple syrup is a great natural sweetener. It not only sweetens withe the maple flavor, but also add nutrients, unlike other sweeteners. Remember though, that this is still sugar, so use the minimum amount possible to help keep sugar spikes to a minimum. Hemp Seed – Want to pack in more omega-3s? Hemp seeds are another great source for those health packed fats. Almonds – Did you know almonds are technically a seed and not a nut? These buddies are packed full of nutrients and can add a good crunch to many dishes. There is extensive research currently being done that shows that almonds may help lower cholesterol, and reduce the risk of heart disease and cancer. Those are all wins in my book. In a mixing bowl, stir together, pumpkin, sweetener, vanilla, apple pie spice and chia seeds until well combined. Slowly stir in milk until all ingredients are uniform and no clumps exist. Transfer to a sealed jar (I like a wide-mouth mason jar) and place in the refrigerator overnight, or for at least two hours. To serve, spoon into a bowl and top with desired toppings. As a nurse, there are weeks of work where I don’t sit longer than to quickly shove down my lunch down and to speedily chart. There are times I end a day with my legs aching and barely the strength lift open my eyes and all I can think is “my brain hurts.” But even in those moments, I can sit and say I love what I do. I didn’t choose it because it was easy, I chose it because I care. I’ve written about my job often, about how it isn’t easy and why I love it. This isn’t anything new. But every day I discover something new about why I love what I do. I love that my friends have different interests and passions. Hearing about what other people do for their jobs is one of my favorite things. We were all created differently and with a separate purpose. Even within my field there are many different types of oncology nurses and I get to learn how to be a better nurse through each of them. 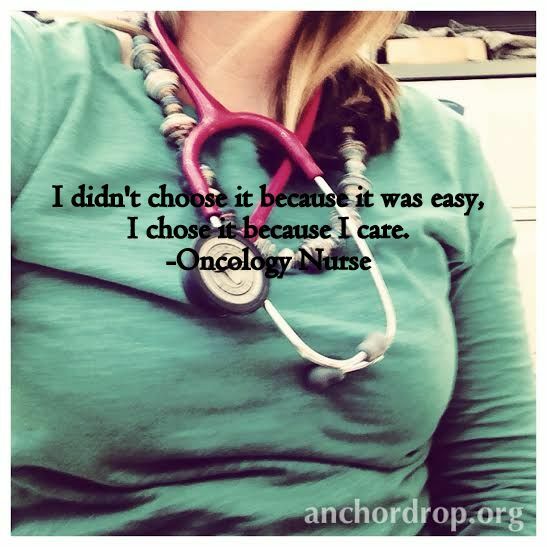 There is one thing that is in common though with each oncology nurse I know. They care and they care deeply. I don’t know what your passions are. I don’t know if like me you are a nurse or if you like economics or if you get how computers work from the inside out or if you create the most beautiful things. But I hope you love what you do. Or have something in your life that you love what you get to do there. I can say even in the toughest moments of my life when I know I’m hugging that young mom for the last time or I’m speaking to the family member as they look at me and ask me if their loved one is dying I love what I do. Because I know without a doubt I was created to do this. Note: this post was originally published on November 10, 2014. I’ve been thinking a lot about space lately. All kinds of space, but mental space especially. Josh and I took on cleaning out his parents’ basement recently in preparation for a garage sale. You would not believe the number of VHS tapes we recycled. Or the number of times we heard from his dad about how each item is definitely going to sell, it’ll be worth a lot of money. just you wait. Over the past few weeks, I’ve made many decisions to change the way I live, or had been living. It’s not that I was extremely unhealthy, but I was making unhealthy decisions that were wreaking havoc on the state of my brain, body, and heart. I have a stressful career (as many careers are), but in many fields of nursing, from the time you walk in to the time you leave you are moving. You’re moving both body and mind and have to be on your A-game at all times. Human lives aren’t something to mess around with. As a result, I have to be very conscious and careful of the decisions I make both inside and outside of work to stay healthy. One of the biggest changes I’ve made in the last month is going gluten-free. I’ve had many physicians suggest at least trying it, but I was insistent corn was enough and that I was fine with gluten. I even thought that there was no way I would have all the symptoms they say happen when you take gluten out. Well, about 24 hours in to being gluten-free, it was clear I was wrong – others were right. I was severely fatigued, extremely pale, itching everywhere, and just felt miserable. This lasted for about a week, and then all the sudden I felt the better. A month into it I feel the best I’ve felt in years. I feel like myself again. Even if I am one of the people who can’t tolerate gluten, I still don’t think that gluten-free is for everyone, but it is for me, at least for now. As a Christian, the Sabbath is taught, but many years into my faith I am just beginning to understand how truly a day of rest is important. This doesn’t mean sitting on the couch all day, but it means doing things that give life to me and making sure I do rest properly on this day. I’m great about walking and good about exercising, I’m awful at stretching. In the last few weeks since making a point to stretch. I can’t explain the difference it has made, but it is wonderful. It took me a long time to learn there is such a thing as saying no to good things. Letting go of people pleasing and truly asking the questions… Is this going to stress me out to an unhealthy level? Will this fill me up? Is this an absolute must? Choosing to make my yeses full good yeses and saying no even when it’s hard. It is okay to say no because you need a night at home. It is okay to say no because you have errands to do. It is okay to not do everything. It isn’t an always thing, but I want at least an hour out of my day to be technology free. Whether this is reading, walking without my phone, cooking… whatever it is, take time away from technology and social media. I’m hoping to continue to increase this time, especially on weekends. We don’t know the long term effects of technology, but we are starting to see some short term effects and some aren’t pretty. I got my fitbit in April and it has been a great tool. I notice such a change in my energy when I keep up my fitness level. A minimum of 10,000 steps 6/7 days a week is my goal. An attainable, challenging goal that helps to keep me healthy. This is the most important to me. Somewhere along the way after bad relationships and failed dreams, I left dreaming behind. But the truth is, the heart needs to dream. The heart needs to acknowledge what it is it desires to do most. So I’m taking the chance to dream again, and not just dream, but dream big. Some of these steps are harder than others, but they are all beneficial. As I sit here after truly putting these into practice for the last few weeks I feel great. I feel rested, I feel healthy, and I feel like myself. You can’t always control you health issues or diseases, but you can make the decisions to live the healthiest you can at that moment. It isn’t fun at every restaurant having to list of allergies and intolerance, but being up all night itching from hives and being extremely fatigued the next day is far worse. Choose to be healthy. Choose to chase out the end of 2015 as the healthiest you there can be right now. I don’t know about you, but summer seems to have come and gone and with the busyness there were plenty of bad habits acquired. We as a team at Anchor Drop have decided to shake some bad habits and pick up some healthier habits this fall and we are excited to share this journey with you. Some of us are making diet changes, while others are making changes in schedule, others are choosing to be more active, and others are choosing to make more time for themselves. Any combination can help each of us to be healthier and happier individuals. One of our favorite things about the AD team is that we are all at very different periods in life, but we can all relate and do life together. We encourage you as we share our changes and journeys towards healthier lives for you to share your journeys with us. Living healthier is something that is a daily decision. No one will be perfect every single day, and we all need cheat days. Some of us don’t need to work on our diet, but do need to work on our schedules. Others are doing really well at making time for themselves, but they aren’t being as active as they should to reap the health benefits. So wherever you are, and whatever health changes you are choosing to strive for, we encourage you to journey with us. We can all take steps to being healthier one day at a time as we chase out the end of 2015! If you had met me a year ago, you would have been greeted with a loaf of freshly baked bread drenched in butter, some homemade jelly and a smile. I loved to bake, and whatever I baked, I most definitely ate. Not only was I addicted to anything filled with carbs, I had an obsession with cheese and a love affair with sugar. Sure, I ate “healthy” but you better believe that I indulged in baking up any decadent recipes that crossed my path. But all that changed when we participated in a Whole30 this past May.